It is important to have serious end-of-life discussions with the elderly. We talk a lot about how important it is to have those serious end-of-life discussions with your elderly loved ones as they enter their golden years. It’s so important to hash out their preferences for care while they are still fully cognizant, before any decline in mental capacity. We also know that under the best of circumstances this can be awkward and, when emotions kick in, even painful to the family to face these issues head-on. All this can feel downright impossible if the senior is not cooperative. This intractability can be the result of their age accompanied by lessened patience, a personality shift due to an underlying disease condition, or it may just be an extension of a lifelong contrariness. While we usually dismiss their resistance as “a phase,” we must understand that the elderly have much to lose. Their diminished physical capacity leaves them vulnerable to many losses, especially the loss of their independence as the captains of their fate. They fear these conversations may mean yielding their housing, financial, and day-to-day decisions to third parties they don’t necessarily fully trust or respect. Understandably, they don’t want to deal with that. This is only exacerbated when relationships with potential caregivers have been rocky in the past. So, how do we get the critical conversation going? 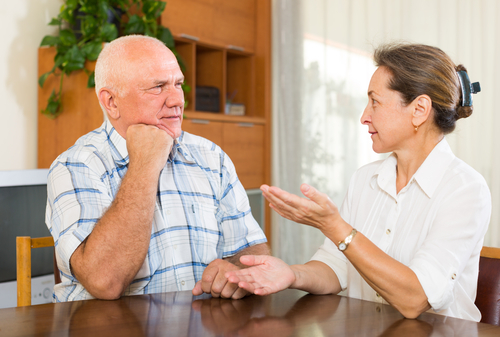 How do we get recalcitrant seniors to engage? Each case is unique. I don’t pretend that my suggestions will work in every case. These are just pointers I have picked up from years of studying and dealing with the elderly. First and foremost, I always find it best to approach the elderly with the respect they deserve. They need to know their opinions matter the most here. You must make it perfectly clear that they have a voice and your desire is to comply with their wishes. I cannot stress how crucial real and deep listening is in this situation. Threats and scare tactics are unduly harsh and totally counterproductive. See your role as one of facilitator with agenda questions. You should be hearing their voice much more than your own. Ask how they would like you to handle any hospital stay and follow-up care. What kind of insurance do they have in place to cover all this? The David York Agency website has an excellent checklist on our resources page that can be used as a guide for end-of-life planning. Gently broach the subject of what they would like you to do if they are suddenly ill. I would back away immediately if there is any resistance. It may take a few tries to get through this conversation, but that is OK. These get them to start thinking. The failed attempts are warmups to the successful one. In certain cases, you might want or need a family meeting with the senior included. On the other hand, you may not want to make a “federal case” out of the whole thing by calling a potentially intimidating meeting. If you call a meeting, make sure not to muddy the process by holding it during a holiday. Holiday time doesn’t lend itself to the focus required to get this task done and may just end up ruining everyone’s celebration. In some instances, a third-party facilitator such as a geriatric care manager or another geriatric professional might be quite useful. This is true whether you have solid family relationships or not. These neutral advisers help to keep fears and emotions in check, everyone on track, and the atmosphere non-threatening. These conversations must be predicated on trust and there is no place for any ill will. Be fair and evenhanded. You will gain a lot more trust if you are honest about the pros and cons of every type of available care and residence option. People are much less likely to get defensive if they feel you are not trying to manipulate them. It may take some time to build that trust—even months—which is why planning is so important here. However, I realize that in many situations time is of the essence, so if you missed out on this lead time, you can still make it up in the end game. Emotional stroking can help a resistant senior be coaxed into engaging. Remind them how much you love them. Moreover, tell them how caring for them would be your pleasure as compensation for all they have done for you all these years. You need to be patient. The world they mastered as they grew from scared child to adult can seem like a scary place again. Emphasize how you are not going to abandon them and will be there for them always. Again—really listen! Repeat their wishes aloud for clarity and so they can confirm what you said. It will calm seniors to know you understand them. Also, it will build the bridge to ease subsequent conversations that may be necessary. I suggest ending with a big group hug. It wipes away any mistakes made during the discussion—and even in years past. Let me know if I can help! PreviousPrevious post:Arts and the Elderly: An Important Connection for Healthy AgingNextNext post:What is Long Term Care? by: Anita Kamiel, R.N., M.P.S.